Home » Start HERE! » What is the Paleo Diet? The Paleo diet is a nutrient-dense whole foods diet based on eating a variety of quality meat, seafood, eggs, vegetables, fruits, nuts, and seeds. It improves health by providing balanced and complete nutrition while avoiding most processed and refined foods and empty calories. Whether you’re looking to lose weight, manage diabetes, reduce risks of cancer and heart disease, mitigate autoimmune disease, improve performance or simply want to experience the best health possible, a diet that is abundant in all the micronutrients that our bodies need and that simultaneously omits foods known to be problematic for health is your best bet. What does this diet look like? Its foundation is the most nutrient-dense foods available to us, including organ meat, seafood, and both huge variety and copious quantities of vegetables, with other quality meats, fruit, eggs, nuts, seeds, healthy fats, probiotic and fermented foods, herbs and spices to round it out. At the same time, it omits foods known to be inflammatory, disrupt hormones, or negatively impact the health of the gut, including all grains, most legumes, conventional dairy products, and all processed and refined foods. Yes, this is the Paleo template. Over the past decade, Paleo has grown from a relatively underground movement to a diet that dominates news headlines, bestselling books, and even products in the grocery store. But despite its popularity, the scientific rationale for Paleo remains wildly misunderstood and misrepresented. For example, we might know that grains are a no-go, that vegetables are fantastic, and that dietary fat is nothing to be afraid of (despite years of the low-fat push from various health authorities), but why are these guidelines in place? Here’s a hint: the answer has little to do with reenacting what our early ancestors ate, and everything to do with what modern science says is best for our bodies! In short, Paleo is a nutrient-focused whole-foods diet, with the goal to maximize foods that heal and minimize foods that harm. It improves health by providing balanced and complete nutrition while avoiding most processed and refined foods and empty calories. It’s not a way to simply lose pounds quickly (even though, for many people, it has that effect! ), and it’s not a fad that dissolves under scientific scrutiny; rather, every Paleo principle is rooted solidly in the latest research and data. At it’s core, the Paleo diet is a plant-based diet, with two thirds or more of every Paleo meal consisting of plant foods and only one third of every plate taken up by animal foods. Of course, meat consumption is enthusiastically endorsed as well because it provides vital nutrients not obtainable from plant sources. Sourcing the highest quality food you can is encouraged, meaning choosing grass-fed or pasture-raised meat, wild-caught seafood, and local organic fruits and vegetables whenever possible. See The Diet We’re Meant to Eat, Part 3: How Much Meat versus Veggies? and The Importance of Vegetables. Variety is very important because a variety of different foods supplies a variety of different nutrients. By focusing on as many different whole foods as possible, it’s easier to achieve sufficient and synergistic quantities of all the nutrients, including potentially some that haven’t been discovered yet. Easy strategies to increase variety include “eating the rainbow”, meaning that you choose fruits and vegetables of different colors, and “eating snout-to-tail”, meaning you eat every part of the animal, including offal. For a complete list of Paleo foods, click here. How can the Paleo diet improve health? Long-term studies show that the Paleo diet improves all-cause mortality, a marker of overall health and longevity. One large study showed that following a Paleo diet reduced all-cause mortality by 23 percent, comparable to the Mediterranean diet. Every single study of the Paleo diet has shown benefits to health markers. And, studies of the Paleo diet have now followed participants for as long as two years with zero adverse events reported. Two years is considered ample time for any potential down-sides to Paleo to turn up. At this point, there are none! For details, see Paleo Diet Clinical Trials and Studies. By focusing on the most nutrient-dense foods available and by eliminating foods that can contribute to hormone dysregulation, inflammation, and gut dysbiosis (where the bacteria in your gut are the wrong kinds, wrong diversity, wrong numbers, and/or in the wrong part of the gastrointestinal tract), a Paleo diet can improve a vast array of health conditions. It’s also great for weight normalization, meaning that overweight and obese people tend to lose weight but underweight people tend to gain weight. The Paleo diet provides the foundation for a healthy digestive system. It supports healthy growth of a diversity of probiotic bacteria in the gut through its focus on prebiotic and probiotic foods and through its avoidance of foods that contribute to gut dysbiosis (where the bacteria in your gut are the wrong kinds, wrong diversity, wrong numbers, and/or in the wrong part of the gastrointestinal tract). It supports the health of the tissues that form the gut barrier by supplying essential nutrients required for gut barrier integrity and by avoiding foods that are inherently difficult to digest, are known to irritate or damage the tissues that form the gut barrier, or that are known to stimulate the immune system. The Paleo diet reduces inflammation and supports normal functioning of the immune system. Foods that are inherently inflammatory are avoided, removing this unnecessary stimulus for increased inflammation. By providing the essential nutrients that the immune system requires to regulate itself, an overactive immune system can be modulated. By providing the essential nutrients that the immune system needs to function optimally, a suppressed immune system can recover. The Paleo diet supports liver detoxification systems by supporting gut health and by providing the essential nutrients that the liver needs to performs its functions. The Paleo diet supports hormone regulation by focusing on foods that contain the nutrients required for hormone balance and avoiding foods known to stimulate or suppress vital hormone systems. Because providing the body with the essential nutrients that it needs to be healthy forms the basis of the Paleo diet, every system in the human body is positively affected by this approach to food. The Paleo diet is also the first time a set of diet principles has been compiled using modern scientific health and nutrition research. While the initial insight leading to the Paleo diet was gleaned from studies of Paleolithic man and both modern and historically-studied hunter-gatherers, the core support for this way of eating comes from contemporary biology, physiology, and biochemistry. There are thousands of scientific studies that each evaluate how components in foods interact with the human body to promote or undermine health. These are the studies used to form the basic tenets of the Paleo diet, which you can read about in detail in Paleo Principles, the most comprehensive Paleo guidebook every created. 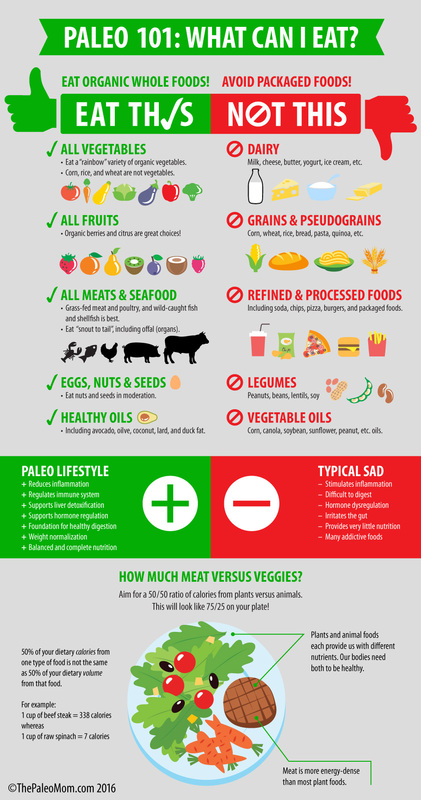 There are no hard and fast rules about when to eat, how much protein versus fat versus carbohydrates to eat (Paleo is not a low-carb diet, see Carbs Vs. Protein Vs. Fat: Insight from Hunter-Gatherers), and there’s even some foods (like high quality dairy, white rice and potatoes) which some people choose to include in their diets whereas others do not. This means that’s there’s room to experiment so you can figure out not just what makes you healthiest but also what makes you happiest and fits into your schedule and budget. Best of all, the Paleo diet is not a diet in the sense of some hard thing that you do that requires a great deal of willpower and self-deprivation until you reach some goal. It’s a way of life. Because the focus is long-term good health, the Paleo diet allows for imperfection but educates you so that you can make the best choices possible. Sustainability is an important tenet of the Paleo diet, meaning that this is a way of eating and living that you can commit to and maintain for your entire life. This means that you have the flexibility to experiment with your own body to discover what is optimal versus what is tolerable, to find what works best for you and fits into your life for the long term. For some people, flexibility is achieved by following an 80/20 rule (or a 90/10) rule, which means that 80% (or 90%) of your diet are healthy Paleo foods and the other 20% (or 10%) are not. Many people find that they are healthiest when their 20% (or 10%) continues to avoid the most inflammatory foods such as wheat, soy, peanuts, pasteurized industrially-produced dairy, and processed food chemicals. What don’t you eat on the Paleo diet? 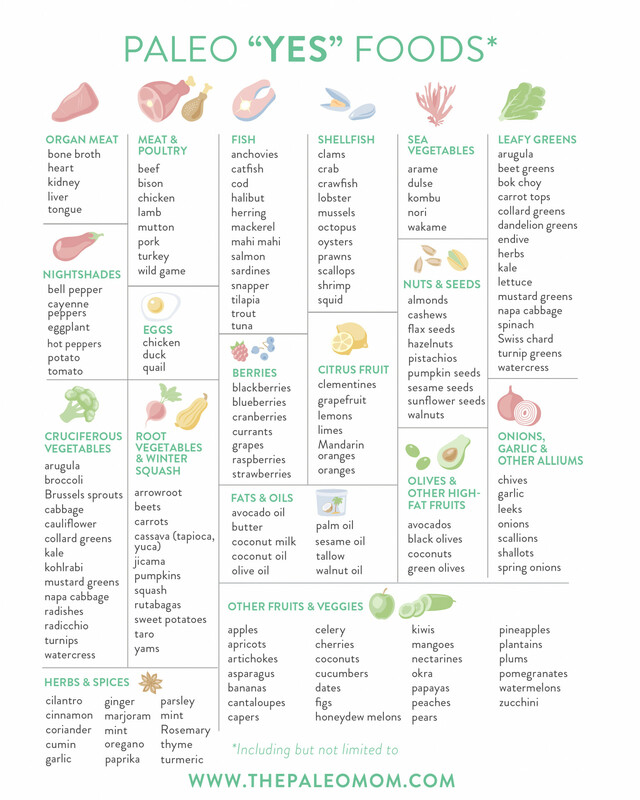 The foods that are eliminated in a Paleo diet are the ones that provide our bodies with very little nutrition (especially for the amount of energy they contain), and that are difficult to digest (which can cause gut health problems and contribute to gut dysbiosis), and have the ability to stimulate inflammation or mess around with important hormones. There are many foods that can be additionally problematic, especially for those with chronic health conditions, typically referred to as “gray-area” foods (see the Autoimmune Protocol). There are also many foods that might be tolerated and reintroduced to your diet after an elimination phase. This is generally referred to as the “shades of Paleo”. Some people enjoy white rice in their diets. Others include good quality (i.e., grass-fed) dairy products, which is generally considered fine with the caveat that a large percentage of people are sensitive or intolerant (and might not know it). The best way to know whether or not these foods work for you is to cut them out completely for a few weeks and then reintroduce one at a time and see how you feel. The Paleo diet, while sometimes referred to as “the caveman diet“, is not a historical reenactment of our paleolithic ancestors from the Stone Age. It’s not an all-meat or meat-heavy diet as it is sometimes portrayed, and in fact, the Paleo diet puts great emphasis on eating tons of veggies (8+ servings per day, see The Importance of Vegetables and The Link Between Meat and Cancer?). The Paleo diet is not zero-carb, low-carb or ketogenic diet (see How Many Carbs Should You Eat? and Adverse Reactions to Ketogenic Diets). Healthy sources of Paleo carbohydrates include fruit (apples, bananas, melons, berries, citrus, plantains… see Why Fruit is a Good Source of Carbohydrates) and root vegetables (sweet potatoes, squash, parsnips, yucca…). The Paleo diet is not a dogmatic approach to eating with no flexibility, room to cheat, or ability to self-experiment. In fact, a key tenet of the Paleo diet is recognizing bioindividuality and providing the broad education to help everyone understand the best choices but also figure out what works (and doesn’t work) for them as an individual. Another key tenet is individual sustainability, meaning that you make the best choices as often as possible, but you don’t need to be perfect. Ideally, you’ll learn what your body needs to thrive and what it tolerates and then live somewhere in between (and if that means the occasional slice of birthday cake or ice cream, that’s okay! see Making Healthy Choices: What’s Your Currency?). The Paleo diet is also not just a diet. Most people refer to it as the Paleo lifestyle or Paleo template to emphasize that this is a way of living, not a diet that you go on for a few months to lose some weight for a wedding, and that it incorporates equal focus on lifestyle factors (like sleep, stress management, activity and community; read more here), sustainability, regenerative farming practices, and environmental protection. This website is full of articles, easily accessed through the menus or the search function, that address most aspects of the Paleo diet and lifestyle. If you enjoy the science, you’ll love my newest book, Paleo Principles which includes 200+ recipes, and twenty meal plans with shopping lists! Also, learn more about the Paleo Lifestyle here and about the Autoimmune Protocol here. And, get complete Paleo diet food lists here.